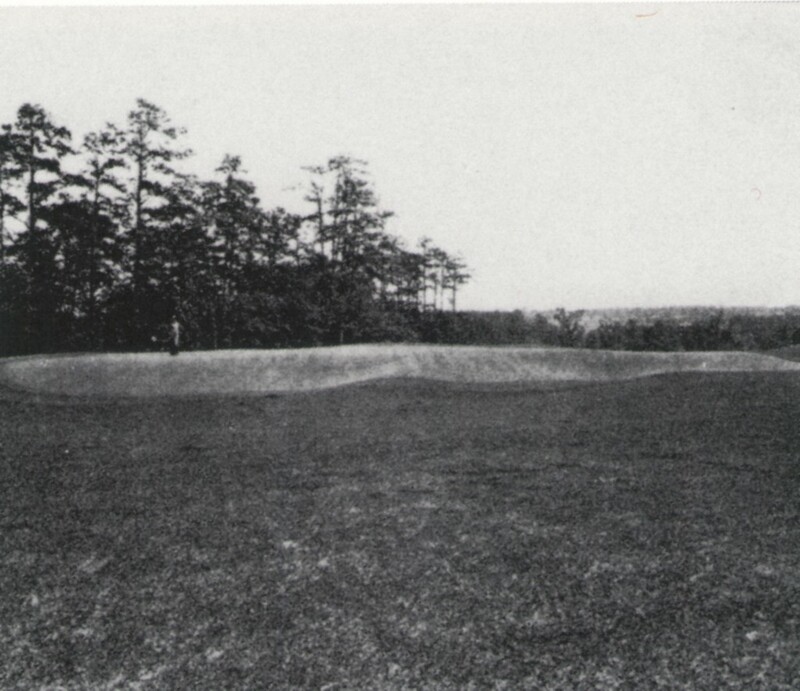 Augusta National's fifth green in 1935. The fifth hole is the centerpiece of what has sometimes been called Augusta National’s other Amen Corner. It’s ranked by more than a few players as the second best par-four on the course (after the tenth), and television cameras don’t do justice to its dramatic topography. Alister MacKenzie, who designed the course, felt that the fifth was descended in spirit from the Road Hole—the much feared seventeenth hole on the Old Course at St. Andrews. The main similarity may be in the difficulty of the approach shot, since balls that land short invariably stay short, while balls that are hit long occasionally disappear for good in the trees and shrubbery beyond the green. The perils of the green make Jack Nicklaus’s achievement during the 1996 Masters seem all the more astonishing: he eagled the fifth twice, in consecutive rounds. The pair of large, steep bunkers on the left side of the fairway are a characteristic MacKenzie hazard. (Equally characteristically, Bobby Jones initially felt that the bunkers were superfluous, and they were not added until after the course had opened.) As originally positioned, they were more of a visual hazard than an actual one, since even in the early years players didn’t have much trouble driving over them or playing safely to the right. (The bunkers often aided less skilled players, by stopping pulled or hooked drives that might otherwise have run down the steep hill and out of play—as Wendell Miller, the contractor, predicted they would, in May, 1933, while making an unsuccessful attempt to interest Jones in adding the bunkers then.) MacKenzie, throughout his career as an architect, made frequent use of course features that were essentially optical illusions: seemingly narrow fairways that were ampler than they appeared from the tee; seemingly ample fairways on which the ideal landing areas were narrow and precise; large greens that seemed to provide huge targets but were contoured so that reasonably simple putts could be earned only with brilliant approaches—and bunkers that looked threatening from a distance but were easy to carry. He felt that easily avoided fairway bunkers were good for a player’s self-confidence and sense of achievement. By 2002, the bunkers had long since ceased to serve even as visual hazards for the vast majority of Masters competitors. Under the direction of Tom Fazio, the tournament tees were moved back, the fairway was reconfigured, and the bunkers were reshaped, deepened, and moved closer to the green. The carry over the farther bunker from the Masters tees is now more than 315 yards, uphill, and both bunkers are so deep that reaching the green from either one is impossible, or nearly so. Each bunker has an almost vertical forward face, on which a thin layer of sand is held in place by a fabric liner, which also prevents balls from becoming embedded. The fifth fairway caused problems for many years. Buried stones continually worked their way to the surface, where they were a threat to golf swings and mower blades. Finally, in 1962, the club resurfaced the fairway (and also the seventh) with new topsoil. When the job was complete, Clifford Roberts, the club’s co-founder and chairman, devised a characteristically simple method of testing the results: he asked Phil Wahl, the club’s manager, to drive a golf cart up and down the fairway at full speed and report back on the smoothness of the ride. This entry was posted in Architects, Masters, Masters Countdown, Tour Players, Tournaments and tagged Alister MacKenzie, Augusta National, Bobby Jones, Clifford Roberts, Jack Nicklaus, Phil Wahl by David Owen. Bookmark the permalink. really am enjoying this Augusta countdown of holes and their history. thanks! In 1996 “Norman’s loss to Faldo” Gary Player explained the importance of the Green Flags on 5 @ Augusta for the tournament. This is what makes the hole. Ballesteros and Frost played a Moday practice round with Player and both agreed with Gary that if you were not on the right side of the flag you were in danger of losing a shot. You did need agood drive but the second shot was of prime importance. When Jones was a student at Harvard, he was played his golf at the City of Boston municipal course, Franklin Park. It has been said that he liked the 12th hole so much he would play it over and over. #12 at “the Park” (as the locals call the course) is an uphill, dog leg left that bears a striking resemblence to the 5th at Augusta. When I saw #5 at Augusta for the first time, before they lengthened the hole and moved the fairway bunkers, I couldn’t believe how much it resembled #12 at Franklin Park in Boston!